Here at MisteR we used to have a much-loved wee assistant by the name of FiFi. FiFi was our cat and he would spend his days lounging around the studio, yawning and getting fluff on all our fabric, but he kept us smiling and sane through the late nights and busy times. Sadly FiFi left us four years ago and in honour of his memory MisteR did a small run of limited edition print t-shirts with the proceeds of which went to help raise money for our furry little friends at the SPCA. Each year we continue to honour his memory by helping out of one our favourite charities and this year is no expectation. For this year’s annual fundraiser MisteR has made a special limited run of our Commando-M Shoes. 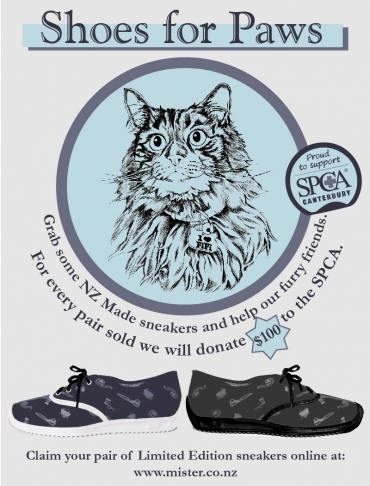 Only 50 pairs have been made, as part of this special fundraiser and we will be selling them at a discounted rate of $150 a pair (normally $199), with $100 from each pair being donated to the SPCA. Together we are hoping to raise $5000 for the SPCA Canterbury, while this may not seem like a lot of money, to the animals that are helped by the SPCA this will provide shelter and comfort in their time of need, many of whom have come from displaced homes or have lost their owners due to the years of disorientating earthquakes. The recent weather problems have also not helped the situation adding further strain on the resources that are already in short supply. This money will be help to change the lives and find homes for the many animals there. Our Commando-M shoes are a remix of the iconic ‘80s sneaker, designed by MisteR and made right here in Christchurch, long continuing our tradition of supporting local business and New Zealand Made. Each pair will also be lovingly packaged in one of MisteR's special handmade shoe bags designed to carefully store your beloved treasure. The Commando-M / FiFi shoes will be sold exclusivley through our online store.